How important the present uprising in Iran is, as it is aimed at toppling a rabid, nuclear trigger-happy regime of Islamofascist apocalyptic cheerleaders, and just how this dovetails with geopolitical forces, is born out by today's post in Elsevier authored by Dutch-Iranian refugee and Leiden University lecturer, Afshin Ellian. Just a few days ago we witnessed a prominent cleric, Grand Ayatollah Hossein Ali Montazeri issue a Jeffersonian Fatwa for Freedom! The mainstream press kept it under wraps, or perhaps they just missed it, busy as they must have been covering Obama's completion of the US Supreme Soviet, or frantically reporting of the latest narcissistic socialight's transgressions. After giving you the translation of Ellian's post we will wrap this up with another enlightening interview on the same topic, published recently on Front Page Magazine. "The West Must Support the Iranian People"
"They've killed my son. For 26 days they've told me that my son was in Ewin Prison. You all know who the murderers are. No one can stop me, no one can stop us. They've killed my boy." Those words were spoken by the mother of Sohrab (19) at his funeral. She wanted to become one with the soil. [ed. Read what happened to Sohrab in "Allah's Sons Keep Up the Killing in Iran"]. A few days ago Mousavi and his wife visited Sohrab's family. 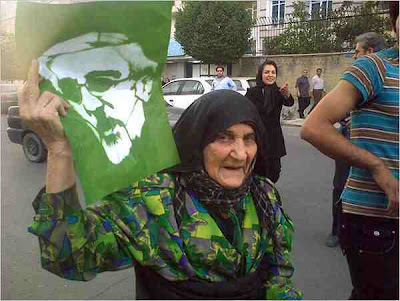 The mother explained to Mousavi that the people will not be stopped. In that part of the city thousands of protesters shouted "death to the dictator". It can all be watched on YouTube [links below]. Last Friday [yesterday] once again hundreds of thousands of people hit the streets. According to several witnesses Tehran's streets contained a million people and more. The BBC states the people shouted: "Azadi, azadi (freedom); Mousavi, we support you." This really was the most historic Friday prayers in Iran. It was crowded, because Rafsanjani (Iran's second man) was giving a sermon. That's why the protesters addressed him: "Rafsanjani, if you are silent today, you are a traitor." Also present were Hezbollah types. They were ferried early morning with buses to the enclosed prayer site. Only once did they dare call for "death to America, death to Israel". The masses outside yelled: "Death to Russia; Russia shame on you, let us in peace". This is just unbelievable. The people have a political consciousness. Yes, the Americans and the Israelis have nothing to do with the situation in the country. But Russia does. The Russians and the Chinese are loyal allies of the regime. They were among the first to congratulate and acknowledge Ahmadinejad as President. The people know the security forces are trained principally by the Russians. [Watch a Russian flag burnt in effigy ceremony here]. The Russians are doing this, because they truly make lots of money from the moronic ayatollahs. All Russian produced airplanes are sold to Iran. It is old junk that isn't worth a dime. But it has killed 2500 people over the course of 20 years. Russia also sells nuclear technology and weapons to Iran. Moscow must understand that if the people succeed in toppling Ahmadinejad's and Khamenei's regime, such dealings will be over. Rafsanjani's sermon was not broadcast on state television, but through the international media everyone knows what was in it: "The regime is in an unparalleled crisis. The people do not trust the Government. The Government must release political prisoners." He also talked about the victims of the uprising. These words were spoken by the regime's second man. It would seem that even Friday's sermon isn't safe territory anymore for the established order. Well informed sources have told me that on June 15 Rafsanjani took delivery of a letter sent by the Revolutionary Guard's High Command. The letter consisted of eight lines, conveying two messages: (a) There's still a red line that must not to be crossed. (b) This goes for Rafsanjani as well, and if he joins Mousavi, the Revolutionary Guard (RG) will act mercilessly. The letter was signed by Jafari (Supreme Commander of the RG). The letter ended: cc Ayatollah Khamenei. I've never heard of such a thing in my life! Cc the leader. This means that real power is no longer in the hands of Khamenei. In power are a number of very radical ayatollahs and the RG. I hope Western Governments are aware of that, because it is with these people, and not with Khamenei, that they must negotiate Tehran's nuclear ambitions. This is a club that wants a nuclear device very badly indeed. Almost everyone in the enlightened world is aware of that. If the West should make the wrong choice like Russia did, it will be punished by the Iranians. That is not in the interest of the West. It is clear that the people will take this to the very end. And the West must support them. Also Karoubi, the other Ahmadinejad rival, took part in Friday prayers. In full view of everyone he was attacked by plain clothes scum. His turban tumbled. Isn't that ironic? Even the clergy are no longer safe in Iran. A theocracy is the least safe system for clergymen: there is no separation of judge and prosecution. Sinister, isn't it? The turban tumbled! Isn't that symbolic for the Islamic regime itself? Islamofascism without a turban! Perhaps the end of Iranian Islamism is neigh. Frontpage Interview's guest today is Konstantin Preobrazhenskiy, a former KGB agent who became one of the KGB’s harshest critics. He is the author of seven books about the KGB and Japan. His new book is KGB/FSB's New Trojan Horse: Americans of Russian Descent. FP: Konstantin Preobrazhenskiy, welcome to Frontpage Interview. Is Russia America’s ally in fighting Islamic terrorism? Preobrazhenskiy: No absolutely not. And this is one of the many American prejudices and misunderstandings of Russia. Americans generally believe that Russia is as afraid of Islamic terrorism as the U.S. is. They are reminded of the war in Chechnya, the hostage crisis at the Beslan School in 2004 and at the Moscow Theater in 2002, and of the apartment house blasts in Moscow in 1999, where over 200 people were killed. It is clear that Russians are also targets of terrorism today. 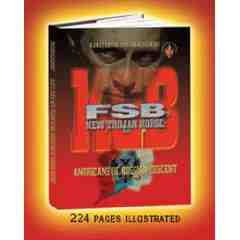 But in all of these events, the participation of the FSB, Federal Security Service, inheritor to the KGB, is also clear. The FSB’s involvement in the Moscow blasts has been proven by lawyer Mikhail Trepashkin, a former FSB Colonel. For this he was illegally imprisoned in 2003. A key distinction between Russian and American attitudes towards Islamic terrorism is that while for America terrorism is largely seen as an exterior menace, Russia uses terrorism as a tool of the state for manipulation in and outside the home country. Islamic terrorism is only part of the world of terrorism. Long before Islamic terrorism became a global threat, the KGB had used terrorism to facilitate the victory of world Communism. For more on the use of terror as a form of coercion in totalitarian systems, see our file "The Unholy Alliance". Oh oh ... NYT reporting fallout from Rafsanjani sermon today. Get this: "Ayatollah Muhammad Yazdi, a conservative member of Iran’s Guardian Council and the former head of the judiciary, lashed out at Mr. Rafsanjani, saying the former president did not have the right to call for the release of arrested protesters. He also said Mr. Rafsanjani had exaggerated the role of democracy in Islamic government and thereby diminished the importance of divine sanction. “Legitimacy and acceptance are different in Islamic government,” Ayatollah Yazdi told the semi-official Fars news agency. “Votes alone do not create legitimacy.”"
Obama, the President of Shoddy Philosophy? Somebody Hand the Pope an AK-47! Confessions of a Rebel: "Why I Strayed"